If the rate of homelessness is a sign of the inequality and poverty that exists in a community, street homelessness is the equivalent of a billboard advertisement. Street homelessness exists to varying degrees across the U.S. It can be blatant, such as that found on the streets of downtown Los Angeles’ Skid Row. Or, it can be a more subtle observation, perhaps passing a man panhandling on the streets of downtown Saratoga Springs. In either situation, seeing a homeless person sleeping, eating, urinating – essentially living – in public, can trigger reactions from passersby that range from empathy and compassion to disgust and fear. While no one necessarily wants people living on the streets in their community, local businesses are often one of the loudest voices in discussions about ridding downtown areas of the homeless. Street homelessness is often perceived to be a threat to business, especially in communities supported by tourism. The desire to maintain economic vitality has resulted in many communities enacting anti-homeless policies, which commonly criminalize behaviors associated with homelessness, such as sleeping outside, panhandling, and sitting on sidewalks. Local business associations, such as Business Improvement Districts (BIDs), are often the ones requesting and even financially supporting these strategies. One of the many problems with anti-homeless policies is that they ignore the root causes of homelessness, such as the lack of affordable housing, adequate employment, and appropriate support services. Criminalizing homelessness is a reaction to the perception of what homelessness causes, rather than a reaction to what causes homelessness. These efforts do little to help the homeless and, in many cases, cause more harm than good. For example, a criminal record can make securing employment and housing very difficult. Criminalization and increased policing are also expensive, and can be more costly than providing housing assistance and support services. However, there are many alternatives to the criminalization of homelessness. 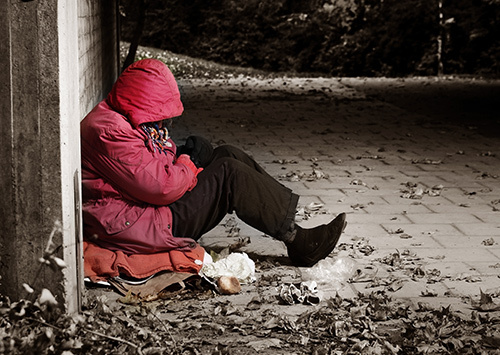 The National Law Center on Poverty and Homelessness has highlighted constructive ways communities can avoid or eliminate anti-homeless policies. Suggested solutions include strategies for creating affordable housing, enhancing homeless services, and creating cross-system and cross-sector partnerships. Business associations and BIDs commonly reinvest revenue into the community to support community concerns. Therefore, one solution is to establish collaborative relationships between homeless services and local business to work together towards a shared goal. Thus, local business can become a positive force in ending homelessness, without the enforcement of punitive and counterproductive policies. This kind of partnership is not yet commonplace, but some communities have had great success. For example, a BID in Washington D.C.’s downtown district employs a street outreach team and collaborates with homeless services, community leaders, and city officials to provide stability through housing and support services. The Washington, D.C. BID is an example of a cross-sector collaboration that has developed and strengthened over many years. However, partnerships between homeless services and local businesses can take many forms. While the most obvious strategy may be to have businesses invest financially, perhaps funding a day shelter to serve as refuge from the street, there are other ways to collaborate. For example, businesses can: contribute funds to nonprofits through donation or grant programs; identify or create employment options for the homeless and unemployed; provide professional services to the homeless, such as pro bono legal aid; and advocate to politicians, funders, and other business leaders on behalf of the homeless and local homeless service needs. In the midst of the growing trend of policies that criminalize an individual based on their status as a homeless person, it is time to consider constructive alternatives. Rather than trying to run the homeless out of town, or contain them all in jails and prisons, our goal should be to help individuals and families exit homelessness. Communities should focus on identifying ways to strengthen and enhance homeless services and housing opportunities so that the homeless can become housed, healthy, and stable. Amanda Aykanian is a PhD. student at UAlbany's School of Social Welfare. She works for the school's National Center for Excellence in Homeless Services and regularly contributes to their blog. She can be reached at aaykanian@albany.edu. This article originally appeared in The Saratogian.